Size ordering activity to include in a Halloween Theme! Includes 2 worksheets and 2 sets of size ordering cards, to practice non-standard measurement skills and order trick-or-treat bags from smallest to biggest. 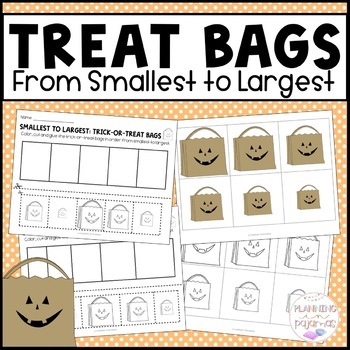 ✓ 2 worksheets to color, cut and glue the treat bags in order from smallest to largest. • 2nd sheet has the columns sized to match, making it self-correcting. 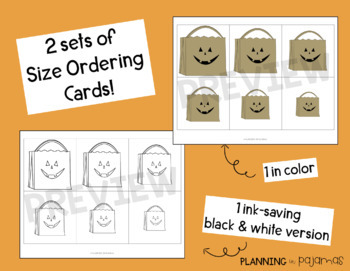 ✓ 2 sets of treat bag size ordering cards, 1 set in color and 1 set in black and white. ➳ For more Halloween activities, click HERE! 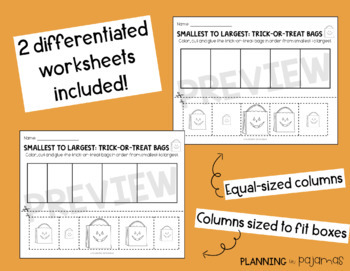 ➳ For more Size Ordering Worksheets/Cards, click HERE! I would LOVE to hear how you've used this product in your classroom! Be the first to know about my new discounts, freebies and product launches! Voila! You will now receive updates about this store!